Brimming with character, Encinitas sits along six miles of beautiful Pacific coastline in northern San Diego County and is embraced by the Batiquitos Lagoon to the north and the San Elijo Lagoon to the south. Encinitas has a population of approximately 60,000 and is distinguished by coastal beaches, cliffs, flat-topped coastal areas, steep mesa bluffs, and rolling hills. View more about Encinitas on Pinterest! 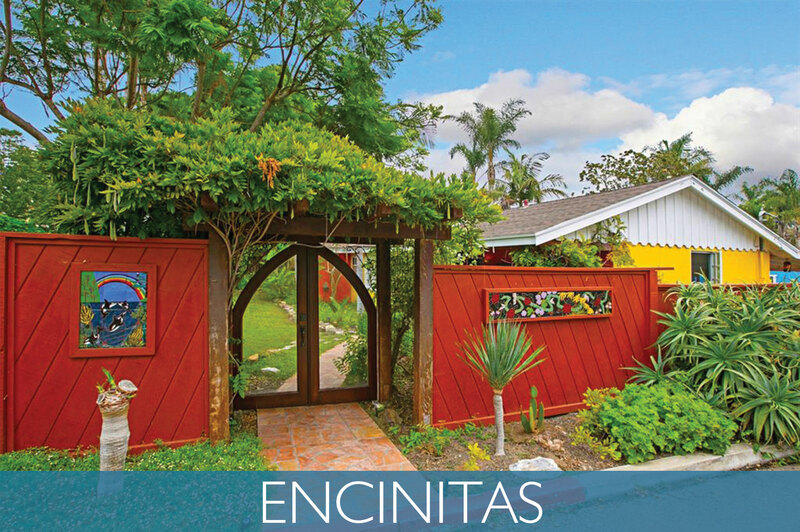 Encinitas is made up of five communities that take pride in their own distinct personalities. "Historic Encinitas" which fills the Highway 101 Corridor and parallels the beautiful beaches and ocean, "New Encinitas" which centers on El Camino Real, "Cardiff By The Sea" which is made up of quaint homes on the hillsides overlooking the sea, "Leucadia" which is famous for its giant eucalyptus trees that line the main thoroughfare on the Coast Highway, and "Olivenhain" which boasts plenty of open horse country, pastures, and a rural way of life. This historic highway 101 corridor, founded over 100 years ago, offers that old style California coastal flavor filled with shops, restaurants, cafes, and historic architecture. New Encinitas ~ A vibrant centerpiece of commerce and opportunity. Although this area has seen explosive growth in the past 10 years, it continues to retain that small town feel. Named after Cardiff, Wales in 1914, many streets still reflect that British flavor, while offering spectacular views of the Pacific. For the outdoors person, there is plenty of hiking, bird watching, biking, and surfing. With Swami’s Beach, this area is known as the surfing capital of southern California. Leucadia ~ A true eclectic nouveau experience on the coast with everything from eucalyptus-lined streets, to antiques and quaint cottages and stunning homes with ocean views. Olivenhain ~ This unique area offers a rural setting filled with ranches, horses, and impressive homes nestled in the hillside. The natural beauty of these communities, along with the year around temperatures between 40 and 85 degrees, make Encinitas a spectacular place to live! Downtown 101 is a coastal shopping district over 100 years old and features historic architecture, quaint shops, sidewalk cafes, and restaurants framed by beautiful flower baskets. The organization “Downtown Encinitas Merchants Association” (DEMA) is a great resource for information on business in Encinitas. The La Paloma Theatre was built in 1928 and was one of the first theatres to show "Talkies", or talking pictures. This theatre is a big part of Encinitas and hosts many community and city functions as well as music concerts, theater performances, and movies. There are many beaches in Encinitas, each having its own unique appeal. There is truly a beach for everyone. Whether it is surfing, scuba diving, tide pooling, sunning, hiking, camping, or just basking in the serenity of a secluded beach, it is all there. For the surfer, there is Swami's Beach, which was forever immortalized in the Beach Boys’ song “Surfin USA”. There is great scuba diving just offshore from Swami's at the Encinitas Marine Life Refuge which is North County's only underwater park. Finally, Moonlight Beach is “the beach with everything” since it has all the typical amenities including lifeguard towers, play areas, restrooms, telephones, and a snack bar. There is a significant flower growing industry in Encinitas and many people claim that it is the “Flower Growing Capital”. San Diego Botanic Garden is the only botanical garden in San Diego County and is dedicated to the conservation of rare and endangered plants from across the globe. Tours, nature walks, lectures, landscaping advice, and instructional programs are offered to advance public awareness of plant diversity and scenic trails take you through unique gardens, a tropical rain forest, and North America's largest display of bamboo. Furthermore, the gardens of the Self Realization Center are beautiful and sit overlooking the ocean in a serene, garden-like setting. This resort offers golfers a wonderful mix of challenge and excitement along with panoramic ocean views. Encinitas Ranch offers 18 championship holes and also has a golf school for players of all levels as well as golf clinics, a pro shop, and snack bar. Walk through the San Elijo Lagoon Ecological Reserve, the largest coastal wetland in San Diego County and a haven for more than 295 species of birds and over 300 species of plants. The reserve encompasses approximately 900 acres of diverse habitat with six plant communities including coastal strand, salt marsh, freshwater marsh, riparian scrub, coastal sage scrub, and mixed chaparral. You may enjoy the beauty of the San Elijo Lagoon where there are over 5 miles of hiking trails in the reserve and they all open to the public. The main routes in Encinitas include I-5, Highway 101, Encinitas Boulevard, and El Camino Real. “Encinitas” is also one of the stops for the Coaster Rail System, located at 25 East "D" Street, which provides rides into downtown San Diego and also connects with Amtrak to provide rides on one of the many Amtrak northern routes to enjoy many wonderful stops along the western coastline. Back in the days of early Encinitas, settlers moved in and started raising families. When the children needed a school, everyone in the community stepped in to build a school for the children.This spirit is very much alive even today! All of the Encinitas district schools have been recognized as "California Distinguished Schools" and consistently rate high in the state and county for their student test scores and academic and supplemental programs. Additionally, La Costa Heights School and Olivenhain Pioneer have been recognized as "National Blue Ribbon Schools". Encinitas' school history of recognition for outstanding schools is a tribute to the efforts of the Encinitas staff, students, community participants, and parents who are actively involved with the schools. Finally, the Encinitas Union School District is committed to increasing the opportunities for K-6 teachers and students to work collaboratively with parents and community members in the areas of Science, Technology, Engineering, Mathematics, and the Arts. Median Sales Price for 92024 For the Past Year.